This entry was posted in osde and tagged lightinthebox, online shopping, salehoo, shop on 28/03/2018 by osde8info. This entry was posted in osde and tagged elitebook, hp, refurbished on 23/03/2018 by osde8info. This entry was posted in osde and tagged flickr, search, smn, storage on 21/03/2018 by osde8info. As an example, only 28% of people identified a grey cloud symbol as meaning it was forecast to be an overcast day. Over 60% thought it meant it would be a cloudy day. But what is the difference between cloudy and overcast? When does a cloudy day become an overcast day? The World Meteorological Organization defines overcast as being ‘the meteorological condition of clouds obscuring at least 95% of the sky.’ But is this what most people think overcast means? 81% of people also believed that a grey cloud symbol indicated that it would rain, despite the fact that our weather symbols use raindrops to indicate rain. So, it seems that despite the weather forecast’s reliance on weather symbols, they aren’t actually widely understood. This entry was posted in osde and tagged 3wordweather, metoffice, weather on 21/03/2018 by osde8info. they just said you have to pay 2 months rental if you cancel ! 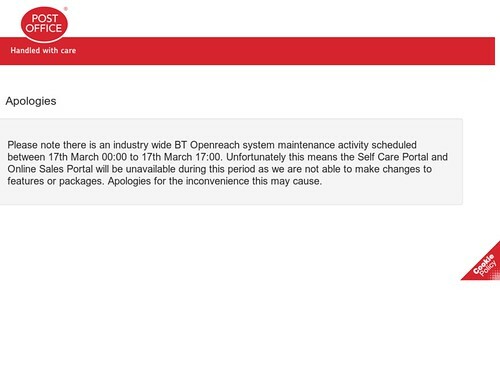 This entry was posted in osde and tagged broadband, customer service, fail, postoffice on 17/03/2018 by osde8info. This entry was posted in osde and tagged groupon, hdtv, marketing, UHDTV on 17/03/2018 by osde8info. This entry was posted in osde and tagged addon, browser, extension, firefox, plugin on 13/03/2018 by osde8info.